Soon after the creation of AGS (then known as The American Geographical and Statistical Society) on May 22, 1851, its first publication, the Bulletin of the American Geographical Society, was issued. At the time, and for forty years after, the Bulletin (also known as the Journal) was the only American periodical devoted to scientific geography. During the Bulletin’s sixty-four year existence, it was the repository of much of the work of importance done in exploration and research in this country. Succeeding the Bulletin is the Geographical Review (GR), produced in 1915. The GR is AGS’s flagship publication and its 100th volume was released in 2010. Notable contributors include Robert J. Flaherty, who introduced the concept for the film Nanook of the North in his 1918 GR contribution, Mark Jefferson, who was the chief cartographer of the American Delegation to the Paris Peace Conference in 1919 and presented his article The Law of the Primate City in 1939, and Dr. Martin Pasqualetti, who in 2011 introduced his theory on Social Barriers to Renewable Energy Landscapes. The Society’s second peer-reviewed publication, FOCUS on Geography, provides insightful articles by professional geographers suitable for use in the classroom. Originally published in the 1970s in quarterly issues, FOCUS on Geography is now an entirely digital and open sourced journal. Currently in Volume 60, Focus on Geography is now divided into three distinct and interactive entities: featured articles, photo essays, and geo-quizzes. The featured articles are submitted by geographers from around the world and explore wide-ranging topic and localities, from human geography in Northern Europe to urban geography in the southern United States. The photo essays detail various modern issues almost exclusively through photos and maps. The geo-quizzes are fun, informative quizzes revolving around a certain topic, such as fresh water, or the Arctic. What sets FOCUS on Geography apart from other geographic publications is that it includes interactive maps which support the writing. 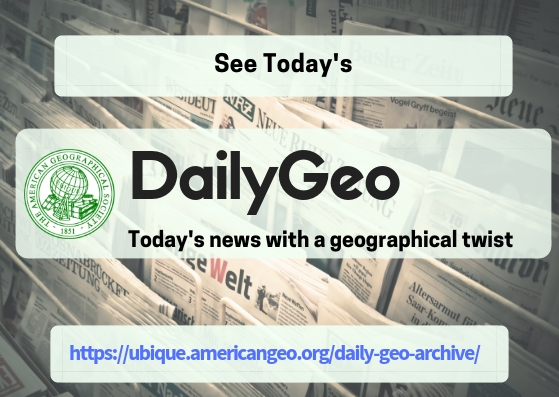 Launched in May 2017, DailyGeo is a short news blast in which we show the ubiquitous nature of geography driving current news stories. Our Chairman, Dr. Chris Tucker, likes to refer to DailyGeo as “brain-candy.” Our readers find it to be geo-informative as well as geo-entertaining DailyGeo is comprised of three main sections: Where in the World, Thumbs Up, and GeoQuestion; sometimes we also include one of our occasional sections: Maps Do it Better, A Cartographer’s Quandary, The Arternative World, and Nothing New.